Limestone monkeyflower is known from the northern Mojave Desert of eastern California and from southwestern Nevada, where also rare. It occurs nearly exclusively on carbonate (limestone) substrate, which is where its common and scientific names come from. 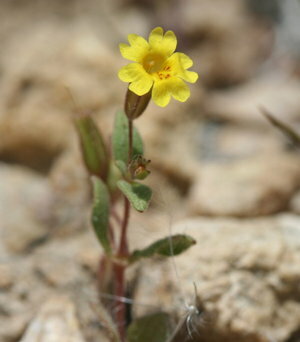 Limestone monkeyflower is currently only known from fifteen occurrences in California, mostly from Inyo County, with one occurrence from Mono County. It can be found in several mountain ranges in the northern Mojave Desert, including: Funeral Mountains, Inyo Mountains, Last Chance Range, Panamint Mountains, and White Mountains. Limestone monkeyflower is possibly threatened by historic mining and non-native plants, and with such a limited global distribution, has been added to California Rare Plant Rank (CRPR) 1B.3 (rare in California and elsewhere; not very threatened) of the CNPS Inventory. Limestone monkeyflower is one of five monkeyflowers that were recently described as new to science by Naomi Fraga (Aliso 30: 49-68, 2012), which are rare, threatened, or endangered in California and are being added or reviewed for addition to the CNPS Inventory. At the time of this writing, not all of these species have been added to the CNPS Inventory. Be sure to check back to the Inventory to see additional information about them in the future.